Precast concrete’s structural and aesthetic versatility, resiliency, accelerated construction, and high degree of quality make it an excellent choice for bridges and other transportation structures including noise barriers, median barriers, and pavement systems. These are comprised of a variety of shapes and components. This section addresses some of the most common shapes and components used in the transportation industry. Designers are encouraged to discuss a project with a precast producer early in the design process to find the best ways to optimize the design. Precast, prestressed flat slabs are used in short span bridges. They typically have spans between 25 and 45 feet between supports. They can have a concrete or asphalt wearing surface cast onto the structure. Typical widths: 6 to 10 ft. Typical spans: up to 45 ft. Typical thicknesses: 12 to 24 in. Adjacent box beams contain centric voids and are used to span short to medium distances with shallow depth superstructure system. They also provide a stay in place formwork for a wearing surface to be cast onto after installation. Typical widths: 3 to 4 ft. Typical spans: 30 to 120 ft. Typical depths: 27 to 42 in. Pretensioned, prestressed beams are the most common precast element used in the bridge industry today. These are used in medium to long span bridges. The girders are typically placed and made composite with a deck. The deck may be cast-in-place or precast. Precast, prestressed concrete beams have been used widely for highway bridges throughout the United States and the world. The simplest and most economical application for precast concrete beam bridges is where full-span beams are used in the bridge. The full-span beams have most often been used as simple spans, although continuity has also been established between spans using a continuity diaphragm at interior piers and various methods to counter negative moments. For simple span, precast, prestressed concrete bridges using conventional materials, the maximum spans for each standard section type are shown in Chapter 6 of the PCI Bridge Design Manual. However, the excellent durability and structural performance, low maintenance, and low cost of bridges using precast, prestressed concrete beams have encouraged designers to find ways to use them for even longer spans. Typical flange widths: 1 to 6 ft. Typical spans: up to 210 ft. Typical depths: 28 to 120 in. Of these methods, the use of high-strength concrete, lightweight aggregate concrete and continuity are growing in popularity. As designers attempt to use longer full-span beams, limitations on handling and transportation are encountered. Some of the limitations are imposed by the states regarding the size and weight of vehicles allowed on highways. Some states limit the maximum transportable length of a beam to 120 ft and the weight to 70 tons. Other states have allowed precast beams with lengths up to 210 ft and weights in excess of 150 tons to be shipped by truck. Unique haul rigs capable of expanding their footprint have a capacity of 340 kips. In other cases, the size of the erection equipment may be limited, either by availability to the contractor or by access to the site. There are sites where access will not allow long beams to reach the bridge. When any of these limitations preclude the use of full-span beams, shorter beam segments can be produced and shipped. These beam segments are then spliced together at or near the jobsite or in their final location. The splices are located in the spans, away from the piers. The beam segments are typically posttensioned for the full length of the bridge unit, which can be either a simple span or a multiple span continuous unit. While the introduction of splices and posttensioning increases the complexity of the construction and adds cost, precast bridges of this type have been found to be very cost competitive with other systems and materials. The longest span in a modern spliced beam bridge in the United States is currently the 325-ft-long river span in a four-span bridge over the Kentucky River near Gratz, Ky. This bridge was originally designed using a steel plate girder, but was redesigned at the recommendation of the precast producer to reduce project costs, which demonstrates the comparative economy of the spliced concrete beam system. Typical flange widths: 1 to 4 ft. Typical spans: up to 325 ft. Typical depths: 28 to 168 in. The use of precast concrete, horizontally curved bridge elements is not new to the industry. A curved monorail guideway at Disneyland was built in the late 1960s and several similar projects followed in the 1970s and 1980s. These ground-breaking projects were followed by the Philadelphia, Pa., airport ramp bridge, designed and constructed in 1983. This bridge was the first application of curved precast concrete girders for roadway bridges. 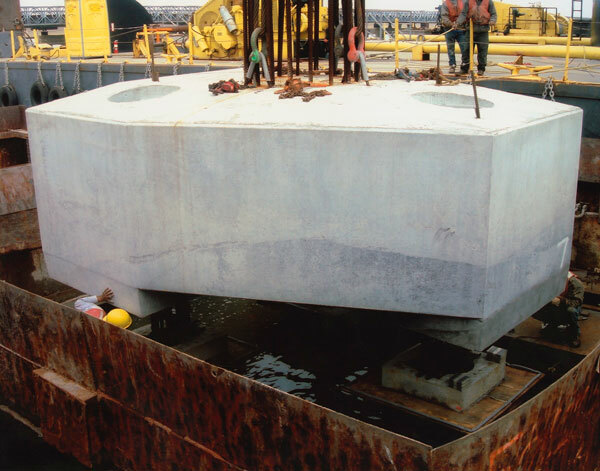 It won the 1985 PCI Harry H. Edwards Industry Advancement Award that identifies "...ideas and concepts that hold the potential to move the precast and prestressed concrete industry to the next generation of technology." There are two additional publications related to curved girders. In 1988, PCI published a report on the concept, analysis and design procedures, design alternatives, and fabrication techniques recommended for horizontally curved precast concrete girders to construct curved bridges (ABAM, 1988). This report describes a complete design for horizontally curved girders utilizing closed sections with 5-in.-thick webs and top and bottom flanges. The girders are plant assembled from 20-ft-long chorded segments and use external post-tensioning (inside the box girder, but external to the concrete cross section). The second publication is Chapter 12 of the PCI Bridge Design Manual—Skewed and Curved Bridges. It provides a good overview of curved bridge configurations, curved girder preliminary design, and structural behavior of curved-girder bridges (PCI, 2011—Sects. 12.3, 12.4, and 12.5). While the use of curved precast concrete girders was successful in each of these applications, the technology has not been widely accepted as an economic alternative to steel or cast-in-place concrete construction in the United States until recently. The Park Avenue Bridge in Denver was built in 1995 and won the 1999 PCI Design Award for long span bridges (PCI Design Award, 1999; McMullen et al., 2008) In 2004, the Arbor Road Bridge was designed and built in Lancaster County, Neb., and won the 2006 PCI Design Award for medium span bridges (PCI Design Award, 2006). Between 2005 and 2010, seven different bridge projects were designed and constructed in Colorado using plant manufactured curved precast concrete members with standard Colorado Department of Transportation (CDOT) U-girder cross sections. Several projects, along with CDOT objectives are described in McMullen et al. 2008. This more widespread use of curved precast concrete construction in a defined geographical location with standardized sections has greatly enhanced the economy of the technology. Each project was constructed in a highly urban environment with curved members supported on modest amounts of temporary shoring (See Fall 2010 Aspire article). This construction method enabled the owner to minimize traffic and construction impacts on the travelling public during construction. Typical widths: 10 to 12 ft. Typical spans: up to 300 ft. Typical depths: 72 to 132 in. Precast End Bent Caps are used in small and large structures. Typical widths: 2 to 4 ft. Typical depths: 36 to 48 in. Precast Pile and Pile Bent Caps are often used for accelerating bridge construction projects. Typical widths: 2 to 8 ft. Typical depths: 32 to 76 in. Similar to Pile bent caps, water line pile caps are designed to simplify dewatering operations and accelerate construction. Typical depths: 36 to 84 in. Precast columns are often used in bridge structures. Columns come in round and square shapes depending on the precast producer, and are also available in custom shapes and finishes to meet project needs. Typical diameters: 2 to 4 ft. Typical heights: up to 30 ft.
Precast pavements slabs offer a quick and durable method of replacing pavement and returning a roadway to service quickly. Slabs are available by select precast producers as both conventional reinforced and prestressed. Precast construction involves the installation of prefabricated concrete panels on grade. The panels themselves provide the final riding surface for the finished pavement and do not require an asphalt or cementitious overlay. They are typically used to replace existing pavement, but can also be used for new construction or to overlay existing pavement. Precast panels are generally provided in sizes to match the width of one, two, or three lanes of the pavement, permitting one or multiple lanes of an existing pavement to be reconstructed at one time, depending on site clearance constraints. The precast panels are generally oriented transversely to the roadway centerline, and may also include shoulders. Panels may be prestressed in both directions. The panels are installed on a prepared base, connected (dowel bars or post-tensioned) together, and opened to traffic. Typical lengths: 12 to 36 ft. Typical thicknesses: 6 to 12 in. These structures are designed and located to meet requirements for noise abatement. They are normally constructed with a post and panel configuration. The project noise study will specify if the system is an absorptive or reflective design. They may include traffic barrier protections when constructed adjacent to the travel lane. Typically these structures are designed to meet the wind load requirements of the AASHTO Specification but designers should check state highway agencies manuals. Typical support widths: 10 to 20 ft. Typical heights: 12 to 24 ft.
Photo and project credit: Creative Form Liners, Inc.
PCI Gulf South's mission is to grow the precast/prestressed concrete industry within the Gulf South Region and increase awareness of the advantages of precast products to design and construction professionals.